Before purification or characterization of intracellular macromolecules such as proteins, organelles, enzymes or active compounds, an efficient method for tissue lysis and cell disintegration is required. Ultrasonication is a effective method for cell preparation that releases the intracellular material from the cell’s interior compartment rapidly into the buffer solution. The mechanical shear forces of ultrasonic tissue homogenization can be adjusted precisely to the specific material, either very soft tissue preparation (e.g. for DNA/ RNA) by mild sonication or destructive cell disruption (e.g. for nannochloropsis, yeast) by intense ultrasonic cavitation. Find below a selection of tissues, cells and other biological matter with sonication protocols and related recommendations, how to prepare your sample efficiently using an ultrasonic homogenizer. Cell disruption in 5-15 sec. Disruption and protein extraction in 3-5 min. Frozen cell samples were thawed for 20 min on ice, followed by cell lysis with PBS containing 1% Triton X-100 for 50 min on ice. During cell lysis each sample was sonicated for 1 min at 80 W with an ultrasonic processor UP100H (Hielscher Ultrasonics). Bernhardt, A. et al. (2008): Mineralised collagen—an artificial, extracellular bone matrix—improves osteogenic differentiation of bone marrow stromal cells. ATCP nano-particles, which are an exceptionally reactive precursor for the formation of hydroxyapatite, were dispersed in chloroform containing 5 % (w/w) Tween20 referred to PLGA using the Hielscher ultrasonic device UP400S at 320W for 5 min. applying pulsed intervals (50%) to allow for relaxation of the particles. Mohn, Dirk; Ege, Duygu; Feldman, Kirifl; Schneider, Oliver D.; Imfeld, Thomas; Boccaccini, Aldo R. (2014): Spherical calcium phosphate nanoparticle fillers allow polymer processing of bone fixation devices with high bioactivity. The Free Library 01 May 2010. 21 January 2014. Anthocyanins: di-glucosides, mono-glucoside, acylated monoglucosides and acylated di-glucosides of peonidin, malvidin, cyanidin, petunidin and delphinidin:Extraction from grape skin in 40 sec. ; pH 5.0; ratio of material/extraction solvent of 1:6. Ultrasonic pre-treatment before extracting oil from the seeds of Jatropha curcas L. to improve extraction. Extraction of Rutin (1.0g milled sample in 30 mL methanol) at 25°C in 5-10 min. Ultrasonic removal of Bacillus anthracis sterne 34F2, Bacillus cereus ATCC 21281, and Bacillus thuringiensis ATCC 33680 spores. The use of 150 ppm of sodium hypochlorite along with ultrasound did lead to spore inactivation. Pamarthi, S.R. et al. : Effectiveness of Ultrasound in Desoiling Bacillus spp spores Embedded in Complex Food Matrices Attached to Various Contact Surfaces. High power, low frequency ultrasound in low volumes of bacterial suspension results in a continuous reduction in bacterial cell numbers i.e. the kill rate predominates. In larger volumes, sonication results in an initial rise in cell numbers suggesting declumping of the bacteria but this initial rise then falls as the declumping finishes and the kill rate becomes more important. Joyce, E.; Phull, S. S.; Lorimer, J. P.; Mason, T. J. (2003): The development and evaluation of ultrasound for the treatment of bacterial suspensions. A study of frequency, power and sonication time on cultured Bacillus species. Ultrason. Sonochem. 10/2003. pp. 315-318. Stimulating or inhibiting the activity of Barley’s Alpha-amylase: The sample (10 g barley seeds) was dispersed in 80 ml of tap water at direct sonication at ultrasonic intensity of 20, 60 and 100% amplitude, cyle of 50% and with additional agitation. The sonotrode was immersed about 9 mm into the solution. The solution was processed at constant temperature of 30C° for 5, 10 and 15 min. UP200S, amplitudes: 20, 60 and 100%; cyle of 50%; Sonotrode S3, 30C°. Cell disruption/ killing of mesozooplankton: by sonication under following conditions of four flow rates (200, 400, 520 and 800 lh-1) and four amplitudes (25, 50, 75 and 100 %) a killing rate between 61 and 97 % has been achieved. Viitaslo et al. (2005): Ozone, Ultraviolet Light, Ultrasound and Hydrogen Peroxide As Ballast Water Treatments – Experiments with Mesozooplankton In Low Saline- Brackish Water. Bacteria cell destruction and release of ß-galactosidase from Bifidobacteria strains: B. breve ATCC 15700, B. animalis subsp. Lactis (BB-12), B. longum (BB-46): 100 mL pasteurized milk blended with bacteria culture was applied with ultrasound. Cavitation causes the destruction of the bacterial cells and at the same time, release of ß-galactosidase. UIP1000hd: amplitude: 10%, power: 80W, amplitude: 100%, power: 200W; Sonotrode BS2d34; 15-30 min. Hung et al. (2009): Ultrasound Aided Yogurt Fermentation with Probiotics. Cell disruption: 15 g BL21-(DE3)_pAtHNL cells were slowly suspended in 50 mM potassium phosphate buffer (pH 7.5) at 0 degC. Okrob, D. et al (2009): Hydroxynitrile Lyase from Arabidopsis thaliana: Identification of Reaction Parameters for Enantiopure Cyanohydrin Synthesis by Pure and Immobilized Catalyst. Adv. Synth. Catal. 2011, 353, 2399 – 2408. An important active compound in boldo is boldine ((S)-2,9-dihydroxy-1,10-dimethoxiaporphine), which is besides catechin ((2S,3R)-2-(3,4-dihydroxy-phenyl)-3,4-dihydro-1(2H)-benzopyran-3,5,7-triol) the main components of the alkaloid and flavonoid fraction in boldo leaves. Boldine is a strong antioxidant agent that undergoes peroxidative free-radical-mediated damage and acts as an efficient hydroxyl radical scavenger. Results: The analysis results show that high-power sonication enhances the analyte release of vegetal matrix material of Boldo at significantly better rates compared to conventional method: equal yield was released by sonication in 30 min. whilst conventional extraction time was 2h. Chemat (2013) and co-workers have shown that ultrasonically-assisted extraction improves the efficiency of the plant extraction whilst reducing extraction time at increased concentration of the extracts (same amount of solvent and plant material). Analysis revealed that the optimized conditions were: sonication power 23 W/cm2 with UIP1000hd for 40 min. and a temperature of 36°C. The optimized parameters of the ultrasound extraction provide a better extraction compared to a conventional maceration in terms of process time (30 min. instead of 120 min. ), higher yield, higher energy efficiency, improved cleanliness, higher safety and better product quality. Petigny, L.; Périno-Issartier, S.; Wajsman, J.; Chemat, F. (2013): Batch and Continuous Ultrasound Assisted Extraction of Boldo Leaves (Peumus boldus Mol.). International Journal of Molecular Science 14, 2013. 5750-5764. Microencapsulation in poly(lactic-co-glycolic acid) in 40 sec. Freitas et al. (2005): Flow-through ultrasonic emulsification combined with static micromixing for aseptic production of microspheres by solvent extraction. Dispersion and nucleotid analysis; sample size: 10 mg samples in 10 ml fluid. Disruption of 15mL in 9min. Extraction of carnosic acid, an active compound, from rosemary. Poly-A RNA was purified with the Dynabeads mRNA purification kit (Invitrogen) following the manufacturer’s instructions and was treated for 30 min at 37°C with TURBO DNase (Ambion; 0.2 units/1 μg of RNA). First- and second-strand synthesis followed the manufacturer’s protocol. About 500ng of double-stranded cDNA was fragmented by sonication with Hielscher’s UTR200. DNA was parceled in 2% high-resolution agarose gel and 230–270 bp fragments were cut. Delft, J. van; Gaj, St.; Lienhard,M. ; Albrecht, M. W.; Kirpiy, A.; Brauers, K.; Claessen, S.; Lizarraga, D.; Lehrach, H.; Herwig, R.; Kleinjans, J. (2012): RNA-Seq Provides New Insights in the Transcriptome Responses Induced by the Carcinogen Benzo[a]pyrene. Toxicological Sciences 130/2, 2012. 427–439. Extraction of glucosamine, muramic acid, alanine, glutamic acid and lysine from caryophanon datum. Homogenization/ preparation of isotopically homogeneous cellulose. Laumer et al. (2009): A novel approach for the homogenization of cellulose to use microamounts for stable isotope analyses. Cellulose nanocrystals (CNC) prepared from eucalyptus cellulose CNCs were modified by the reaction with methyl adipoyl chloride, CNCm, or with a mixture of acetic and sulfuric acid, CNCa. Therefore, freeze-dried CNCs, CNCm and CNCa were redispersed in pure solvents (EA, THF or DMF) at 0.1 wt%, bymagnetic stirring overnight at (24 ± 1) C, followed by 20 min in a sonication bath using UP100H Hielscher Ultrasonics (Germany), equipped with a 130 W/cm2 sonotrode, at 24 ± 1 degC. After that, CAB was added to the CNC dispersion, so that the final polymer concentration was 0.9 wt%. UP100H; at 24 degC for 20 min. Blachechen, L. S. et al (2013): Interplay of colloidal stability of cellulose nanocrystals and their dispersibility in cellulose acetate butyrate matrix. Cellulose 2013. Ultrasonication is used for cell lysis to release the chromatin. Mild (pulsed) sonication is used to fragment the chromatin. Furthermore, ultrasound accelerates the rate of antibody binding to target proteins and reduces thereby the immunoprecipitation time. Basselet, P. et al. (2008): Sample processing for DNA chip array-based analysis of enterohemorrhagic Escherichia coli (EHEC). Lauri, A. (2005): Molecular analysis of petal development by X-ChIP and two-hybrid technology. Dissertation University of Cologne 2005. UP400S; at 30% amplitude and 0.5 cycle; on ice. Oh et al. (2003): Acetyl-CoA Carboxylase Gene Is Regulated by Sterol Regulatory Element-binding Protein-1 in Liver. UP200H; 70% of maximum output; pulse mode: 10 cycles of 20 sec. each. Kang, H. Ch. et al (2010): PIAS1 regulates CP2c localization and active promoter complex formation in erythroid cell-specific a-globin expression. Nucleic Acids Res. 38/ 16, 2010. pp. 5456–5471. Sonication of the adsorbant in the solvent eliminates agglomerates within a few seconds and prepares a uniform, easily packed column. Relevant for adsorbent preparation (e.g. silica gel) prior to column chromatography. Cell disruption of mesozooplankton: by sonication under following conditions of four flow rates (200, 400, 520 and 800 lh-1) and four amplitudes (25, 50, 75 and 100%) a killing rate between 87 and 99% has been achieved. Zaim (2005): Analyse von Nesprin-2 Defizienten Mäusen. Ultrasonic inactivation of Cryptosporidium parvaum (protozoa) in water. Tsukamoto, I.; Yim, B.; Stavarache, C. E.; Furuta, M.; Hashiba, K.; Maeda, Y. (2004): Inactivation of Saccharomyces cerevisiae by ultrasonic irradiation. Ultrason. Sonochem. 11/2004. pp. 61–65. Cubosomes – either empty or doped with fluorophore molecules – were prepared by dispersing the appropriate amount of monoolein in a solution of Pluronic F108 using the ultrasonicator UP100H. To obtain fluorescent cubosomes, the fluorophore was dispersed in the melted monoolein by gentle sonification before dispersion in Pluronic F108. The same procedure was followed when the fluorescent cubosomes were also loaded with quercetin. Sample: sample size: 4 mL – approx. 96.4 wt% of water, 3.3 wt % of monoolein, 0.3 wt% of Pluronic F108. The percentage of the fluorophore was 2.5 × 10−3 and 2.8 × 10−3 wt%. Amount of added quercetin: 6.4 × 10−6 wt%. Sonication: UP100H, amplitude 90%, pulse cycle 0.9, for 10 min. Murgia, S.; Bonacchi,S. ; Falchi, A. M.; Lampis, S.; Lippolis, V.; Meli, V.; Monduzzi, M.; Prodi, L.; Schmidt, J.; Talmon, Y.; Caltagirone, C. (2013): Drug-Loaded Fluorescent Cubosomes: Versatile Nanoparticles for Potential Theranostic Applications. Langmuir 29, 2013. 6673-6679. Borthwick, K. A. J.; Coakley, W. T.; McDonnell, M. B.; Nowotny, H.; Benes, E.; Grfschl, .M (2005): Development of a novel compact sonicator for cell disruption. J. Microbio. Meths. 60/2005. pp. 207–216. / Lörincz, A. (2004): Ultrasonic cellular disruption of yeast in water-based suspensions. Biosys. Eng. 89/ 2004. pp. 297–308. / Tsukamoto, I.; Yim, B.; Stavarache, C. E.; Furuta, M.; Hashiba, K.; Maeda, Y. (2004): Inactivation of Saccharomyces cerevisiae by ultrasonic irradiation. Ultrason. Sonochem. 11/2004. pp. 61–65. DNA fragmentation: 2 min. sonication of 100μL with UP100H or 4 min. sonication of 100μL with UTR200. Larguinho M. et al. (2010): Development of a fast and efficient ultrasonic-based strategy for DNA fragmentation. Extraction of cellular proteins from Drosophila melanogaster S2 cells: Frozen S2 cells (1.56108) were lysed in 1 mL ice-cold homogenization buffer (100 mM Tris-HCl pH 7.5, 1% SDS) and left on ice for 10 min. Cell lysis was completed by ultrasonication on ice (6615 bursts, 0.5 s pulse; 75% intensity) with a Hielscher UP200S ultrasonic processor. UP200S (200W), 75% intensitypulse mode: 6615 bursts, 0.5 s pulse. Schwientek, T. et al. (2007): A serial lectin approach to the mucin-type O-glycoproteome of Drosophila melanogaster S2 cells. Proteomics 7, 2007. pp. 3264-3277. Cell disruption of E. coli derivates: The frozen pellets corresponding to the sample volume of Vculture = 4/OD mL were resuspended in 580 μL 10 mM potassium phosphate buffer pH 7, 1 mM EDTA. 20 μL of lysozyme (concentration of 1 g L-1) was added and the cells suspension was incubated on ice for about 30 min. Afterwards cells were disrupted by continuous ultrasonication with an ultrasonicator (UP 200S Ultraschallprozessor, Dr. Hielscher GmbH, Teltow) on ice, at an amplitude of 50 % for 20 sec. The soluble and insoluble cell fractions were separated by centrifugation at 13000 rpm for 20 min. The insoluble proteins were washed twice with the 10 mM potassium phosphate buffer pH 7, 1 mM EDTA and stored at –20°C. HA (2005): Optimisation of active recombinant protein production, exploring the impact of small heat-shock proteins of Escherichia coli, IbpA and IbpB, on in vivo reactivation of inclusion bodies. Cell lysis and disintegration: The homogenized sample of protein soluble of mature E. granulosus, prepared by freeze-thawing in liquid nitrogen and 42◦C, has been sonicated at 110V, 170W for 3×15 sec on ice. After that, the sample was centrifugated for 15min at 10000g. Protein concentaration was measured by Bradford method and stored at -20◦C. UP200S; 170W, cooling on ice; 3 x 15 sec. Tabar et al. (2010): Serodiagnosis of Sheep Hydatidosis with Hydatid Fluid, Protoscolex and Whole Body of Echinococcus granulosus Antigen. Ultrasonic inactivation of Escherchia coli Gr- in milk and juices. Zenker, M.; Heinz, V.; Knorr, D. (2003): Application of ultrasound assisted thermal processing for preservation and quality retention of liquid foods. J Food Prot 66/2003. pp. 1642–1649. Ultrasonic inactivation of Escherchia coli Gr- in saline. Duckhouse, H.; Mason, T. J.; Phull, S. S.; Lorimer, J. P. (2004): The effect of sonication on microbial disinfection using hypochlorite. Ultrason. Sonochem. 11/ 2004. pp. 173–176. Ultrasonic inactivation of Escherchia coli Gr- in water. Furuta, M.; Yamaguchi, M.; Tsukamoto, T.; Yim, B.; Stavarache, C. E.; Hasiba, K.; Maeda, Y. (2004): Inactivation of Escherichia coli by ultrasonic irradiation. Ultrason. Sonochem. 11/2004. pp. 57–60. RNA fragmentation of optical nerve heads (from rat eyes): The optical nerve head (ONH) was frozen on dry ice and stored at 80°C before extraction. RNA was isolated by sonicating the frozen nerve heads in the kit extraction buffer using an MS 0.5 probe (UP50H) and then, after the instructions provided by the Arcturus kit, including DNase treatment to remove any DNA. Purified RNA was quantified. Johnson et al. (2007): Global Changes in Optic Nerve Head Gene Expression after Exposure to Elevated Intraocular Pressure in a Rat Glaucoma Model. Resuspension of cells: CS pellets in microcentrifuge tubes were resuspended in 0.5 ml of a 0.1mg/ml papain solution in Hank’s balanced salt solution (HBSS) using pulses from an ultrasound horn (UP 100H, Hielscher Ultrasonics GmbH, Germany) at cycle 1 and 100 % amplitude for 3 sec. Thereafter, digestion took place at 60 °C for 24 h.
For Enzyme-linked immunosorbent assay (ELISA), the cells were then suspended in distilled and deionized water at a concentration of 106 cells/ml, and were kept in a freezer at –70°C overnight in order to facilitate cell lysis. The cells were then homogenized by ultrasonication for 40 sec. using the Hielscher ultrasonic tissue homogenizer UP100H. Vandrovcova et al. (2011): Influence of Collagen and Chondroitin Sulfate (CS) Coatings on Poly-(Lactide-co-Glycolide) (PLGA) on MG 63 Osteoblast-Like Cells. Physiol. Res. 60; 2011. 797-813. Lysis of HaCaT cells for Chromatin Immunoprecipitation (ChIP): HaCaT cells were fixed with 1% formaldehyde for 10 minutes at 37uC. The fixed cells were lysed in the RIPA buffer and sonicated on ice with an 100W ultrasonic device at amplitude = 1 and duty cycle = 100% in 12 one-minute (12 x 1 min.) pulses. Zhang et al. (2007): Basonuclin Regulates a Subset of Ribosomal RNA Genes in HaCaT Cells. The ultrasonic method enables to produce a low molecular weight heparin (LMWH). Therefore, heparin undergoes a hydrogen peroxide-catalyzed radical depolymerization. The reaction is very fast and takes less than 1 hour, whilst the physicochemical depolymerization process relies on mild reaction conditions, requires no harsh or toxic reagents, and provides a product free of chemical artifacts. Thus, the ultrasonic process is well suited for the large scale production of LMWH, but also analogs produced from natural sulfated polysaccharides. For the physicochemical depolymerization of unfractionated heparin by ultrasonic-assisted radical depolymerization, heparin was dissolved in water to a final concentration of 25 mg/mL (5 mL). The reaction mixture was sonicated using a probe-type ultrasonicator UP50H. 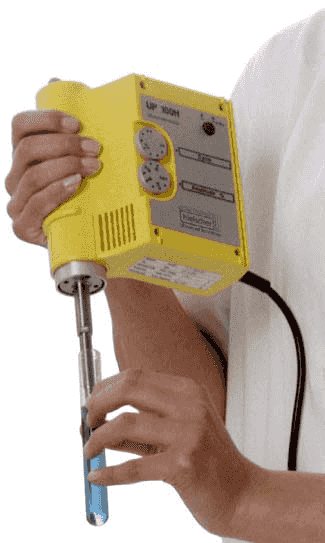 The ultrasonicator was equipped with a probe (micro tip MS3) with a diameter of 3mm, which provided an amplitude of 180μm. The processor generated mechanical longitudinal vibrations with a frequency of 30 kHz that were produced by electrical excitation. The reaction mixture was maintained at 60°C in a Radleys® reactor and ultrasonic waves were applied as a 0.5sec pulse to prevent mixture heating. A zerotime aliquot (250μl) was removed from the solution prior to reaction launching by simultaneous addition of hydrogen peroxide and application of ultrasonic waves. Hydrogen peroxide was added to obtain a final hydrogen peroxide/heparin (w/w) ratio of 0.15 (3.75 mg/mL). Achour, Oussama; Bridiau, Nicolas; Godhbani, Azza; Le Joubioux, Florian; Bordenave Juchereau, Stephanie; Sannier, Fredéric; Piot, Jean-Marie; Fruitier Arnaudin, Ingrid; Maugard, Thierry (2013): Ultrasonic-assisted preparation of a low molecular weight heparin (LMWH) with anticoagulant activity. Carbohydrate Polymers 97; 2013. 684–689. Extraction of active compounds / herbal extracts in water and ethanol. Lactobacillus strains: L. pontis, L. sanfranciscensis, L. farciminis, L. panis, L. oris, L. vaginalis and L. reuteri, L. sp. Procedure: For the DNA isolation of single colonies, an ultrasonic lysis protocol was developed. One colony (2- to 3-mm diameter) was suspended in 100μl lysis buffer (20 mM EDTA, 10 mM Tris [pH 7.9], 1% Triton X-100, 500 mM guanidine-HCl, 250 mM NaCl). Cells were lysed by 1 min of ultrasonication with an probe-type ultrasonicator UP50H. After the addition of 150μl of cold ethanol (-20°C), the mixture was centrifuged over a spin column of the QIAamp tissue kit and finally eluted with 60μl of buffer (10 mM Tris [pH 7,5]). To have a tool for a fast and reliable identification of single pure cultures, the PCR assay was combined with a fast DNA isolation procedure. Time-consuming enzymatic lysis procedures and variable susceptibility of bacteria to the lysozyme were overcome by ultrasonic treatment of the cells, with subsequent purification and concentration by binding DNA to a silica matrix. The cell material of a single colony was found to be sufficient for the PCR. Müller, M. R. A. (2000): Characterization of the Microbial Ecosystem of Cereal Fermentations using Molecular Biological Methods. Dissertation University of Cologne, 2000. Ultrasonic inactivation of Lactobacillus acidophilus Gr+ in milk and juices. Ultrasonic inactivation of Legionella pneumophila Gr+ in diluted medium. Dadjour, M. F.; Ogino, C.; Matsumura, S.; Nakamura, S.; Shimizu N. (2006): Disinfection of Legionella pneumophila by ultrasonic treatment with TiO2. Water Res 40/2006. pp.1137–1142. Leukocyte lysozme activity in myelocytic leukemia: the cell suspension was sonicated for 15 min. and samples assayed for lysozyme activity. The lysozyme concentration of the leukocytes ug./10 cells were determined. Sample preparation: cell suspension was ultrasonically treated and samples assayed for lysozyme activity. The lysozyme concentration of the leukocytes ug/106 was determined. Click here to read more about the ultrasonic liposome preparation! UP50H; 3 cycles of 5 min; in an ice bath. Sonophotocatalytic degradation of Malachite Green (a strong bactericide): The photocatalytic degradation alone is considerably faster than sonolytic degradation, efficiency can be improved by coupling the two processes. Malachite green, a strong bactericide, is very ecotoxic to marine bacteria but it is converted to organics that are less or not toxic. The regioselective acylation yield was up to 84%. cp. : Wang, Z.; Wang, R.; Tian, J.; Zhao, B; Wei, X.F. ; Su, Y.L. ; Li, C.Y. ; Cao, S.G.; Wang, L. (2010): The effect of ultrasound on lipase-catalyzed regioselective acylation of mangiferin in non-aqueous solvents. J. Asian Nat Prod. Res. 12/1, 2010. 56-63. A 1g sample of regolith or crushed rock is subject to liquid extraction under ultrasonic irradiation to extract and solubilise target molecules. Therefore, 3ml MeOH P80 was added to 1g analogue sample in a glass test tube and sonicated for 20 minutes with an ultrasonic probe-type device UP50H set at 40% amplitude. The mixture was allowed to stand for 10 minutes, and the cloudy supernatant that had formed above the sedimented analogue sample was decanted into 1.5 ml centrifuge tubes. To minimize loss of extracted components by adsorption to surfaces of the hydrophobic polymer centrifuge tubes, the tubes were first blocked with 0.5% (w/v) BSA in 100 mM HEPES pH 7.4. The supernatants were clarified by centrifugation at 17000 G for 10 minutes and stored at 2 – 8°C in glass vials until tested in the immunoassay. Rix, C.(2012): Detecting Life on Mars and the Life Marker Chip: Antibody Assays for Detecting Organic Molecules in Liquid Extracts of Martian Samples. Dissertation Cranfield University 2012. The pellets were washed and sonicated for 5 min with a further 0.5 mL of LB2 and centrifuged at 12,000 g for another 20 min, and the resulting two fractions of supernatant were collected. Finally, the pellets were dissolved with 0.5 mL of buffer containing 40 mM tris base, 5 M urea, 2 M thiourea, 4% CHAPS, 100 mM DTT, 0.5% (v/v) biolyte 3-10 (LB3), and were sonicated and centrifuged at 12,000 g for 20 min. Gazzana et al. (2009): An update on mouse liver proteome. Sample homogenization to produce cell lysate. UP200S; for 3 x 20 sec. Ultrasonic inactivation of Penicillium digitatum (a plant pathogen) in Sabouraud growth medium. López-Malo, A.; Palou, E.; Jiménez-Fernández, M.; Alzamora, S. M.; Guerrero, S. (2005): Multifactorial fungal inactivation combining thermosonication and antimicrobials. J. Food Eng. 67/ 2005. pp. 87–93. Extraction of phycocyanin from Spirulina platensis (Arthrospira platensis) cells. 30% packed plant cells (W/V) and distilled water are disrupted by sonication for 1-15 min. ; plant tissue disintegration: 1 g dried tissue suspended in alcohol is disintegrated during sonication of about 5 min. Platelet lysate preparation: Disruption in 1-5 min. Preparation of bovine serum albumin (BSA)-loaded poly(lactic-co-glycolic acid) (PLGA)by sonication in 40 sec. Ultrasonic extraction of polyphenols from apple. Solvent: aqueous. Increased yield by 6%; sonication intensity: 20-75Ws/ml; process temp. : heated to 80 degC. Vilkhu, K.; Manasseh, R.; Mawson, R.; Ashokkumar, M. (2011): Ultrasonic Recovery and Modification of Food ingredients. In: Feng/ Barbosa-Cánovas/ Weiss (2011): Ultrasound Technologies for Food and Bioprocessing. New York: Springer, 2011. pp. 345-368. Ultrasonic extraction of polyphenols from black tea. Solvent: aqueous. Increased yield by 6-18%; sonication intensity: 8-10Ws/ml; ambient pressure, process temp. : heated to 90 degC. Ultrasonic extraction of polyphenols from red grape marc. Solvent: aqueous. Increased yield by 11-35%; sonication intensity: 20-75Ws/ml; ambient pressure. For ultrasonically assisted brining, pork loins (Longissimus dorsi) were immersed in sodium chloride brine (40 g L−1) and treated at 5°C with low-frequency ultrasound (20 kHz) at low-intensity (2–4 W/cm−2). The effect of the ultrasonic assisted curing on porcine tissue microstructure, protein denaturation, water-binding capacity (WBC), water-holding capacity (WHC), sodium chloride diffusion coefficient (D) and on meat textural profile (TPA) was investigated. Results showed that the ultrasonic treatment caused favourable microstructural changes in meat tissue. Water-holding capacity and textural properties were improved by ultrasonic treatment compared to both tumbled and static brined samples. However, these positive effects were highly dependent on ultrasonic intensity. Higher intensities and/or longer treatment times caused denaturation of proteins. The constant diffusion coefficient model was able to describe precisely the NaCl diffusion kinetics during brining. Ultrasonic treatment significantly enhanced the diffusion of salt compared to samples brined under static conditions and diffusion coefficient exponentially increased with increased ultrasonic intensity. Siro, I.; Ven, Cs. ; Balla, Cs. ; Jonas, G.; Zeke, I.; Friedrich, L. (2009): Application of an ultrasonic assisted curing technique for improving the diffusion of sodium chloride in porcine meat. Journal of Food Engineering 91/2, 2009. 353–362. Ultrasonic degradation of polysaccharides from Porphyra yezoensis: 50mL of 1.0 g/100mL porphyra yezoensis polysaccarides (dry weight) solution have been sonicated for 4 hr with an UP400S. UP400S; pulsed ultrasound (cycles: 2 sec on/ 2 sec off) at 20°C. Grinding, deagglomeration and dispersion to small, relativley uniform particle size. Disruption of 1 gm in 5-7 min. Disruption and tissue homogenization with an UP400S. UP400S; 3 times for 30 sec. ; on ice. Disruption of 1 gm in 1 min. Extraction of the alkaloid reserpine. Samples of 10g dry and ground stevia leaves were extracted in 100mL water under continuous stirring (with a magnetic stirrer). The pH value was controlled with 0.01 M pH 7 sodium phosphate. The sample was put in a 150 mL glass beaker and sonicated with an probe-type ultrasonicator (UIP500hd, 20kHz, 500W). The tip of the sonotrode was immersed about 1.5 cm into the slurry of stevia leaves. The ultrasonic device was set for a power output of 350W. A mild sonication treatment of 350 W for 5-10 min. at a constant process temperature of 30°C gave a rebaudioside A yield of 30-34g per 100g sample. After sonication, the extract solution was centrifuged and filtered off through 0.45 μm microporous membrane; the filtrate was taken for total rebaudioside A content analysis. The extraction yield of total rebaudioside A content was analyzed by HPLC. By the solvent-free ultrasonically-assisted extraction, a high yield of rebaudioside A was obtained in comparison to traditional extraction methods such as heat extraction or maceration. Disruption, starch isolation, and break of noncovalent bonds between protein and starch in a rice flour slurry (33%) in 20 – 40 min. UP500hd; 20 – 40 min. Cell disruption of mesozooplankton: by sonication under following conditions of four flow rates (200, 400, 520 and 800lh-1) and four amplitudes (25, 50, 75 and 100%) a killing rate between 58 and 85% has been achieved. release of galactokinease in 4 min. Guerrero, S,; López-Malo, A.; Alzamora, S. M. (2001): Effect of ultrasound on the survival of Saccharomyces cerevisiae: influence of temperature, pH and amplitude. Innov. Food Sci. Emerg Technol. 2/2001. pp. 31–39. Ultrasonic inactivation of Saccharomyces cerevisiae in Sabouraud growth medium and in saline. Yap, A.; Jiranek, V.; Grbin, P.; Barnes, M.; Bates, D. (2007): Studies on the application of high power ultrasonics for barrel and plank cleaning and disinfection. Austr. NZ Wine Indust. J. 22(3)/ 2007. pp. 96–104. Extraction of active compounds (flavors and color agents). Click here to read more about the extraction from saffron! Kadkhodaee et al. (2007): Ultrasonic Extraction of Active Compounds from Saffron. Ultrasonic inactivation of Salmonella Senftenberg 775W Gr- in McIlvaine citrate-phosphate buffer or nutrient broth. Álvarez, I.; Manas, P.; Virto, R.; Condón, S. (2006): Inactivation of Salmonella Senftenberg 775W by ultrasonic waves under pressure at different water activities. Int. J. Food Microbiol. 108/2006. pp. 218–225. Extraction of biological active compounds: sodium Danshensu and four tanshinones (dihydrotanshione I, tanshinone I, cryptotanshinone and tanshinone IIA). Extraction of active compounds from Salvia Officinalis (sage) in less than 2hr. Sheep cystic livers, lungs and positive blood (Echinococcus granulosus antigens in lambs): The sample was then sonicated for 2 × 15 sec on ice until no intact protoscolices were visible. UP200S; 2 x 15 sec. Tabar et al. (2009): Antibody response against hydatid fluid, protoscolex and whole body of Echinococcus granulosus antigens in lambs. Deagglomerate a slurry containing the dispersant Sorbitant Trioleate, ethanol (as solvent) and Bi-2212 powder. Mora et al. (2009): Fabrication of Superconducting Coatings on Structural Ceramic Tiles. ultrasonic extraction of soy isoflavones in water and solvent. Increased yield of up to 15% in extraction efficiency. Rostagno et al. (2003), referenced by Vilkhu, K.; Manasseh, R.; Mawson, R.; Ashokkumar, M. (2011): Ultrasonic Recovery and Modification of Food ingredients. In: Feng/ Barbosa-Cánovas/ Weiss (2011): Ultrasound Technologies for Food and Bioprocessing. New York: Springer, 2011. pp. 345-368. Ultrasonic extraction of soy protein in water and alkali (sodium hydroxide). Increased yield by 53%. Inline sonication was found more efficient as batch extraction (inline sonication gave a 23% higher yield than batch sonication). UIP1000hd for batch/ beaker and with flow cell reactor for inline sonication. Moulton and Wang (1982), referenced by Vilkhu, K.; Manasseh, R.; Mawson, R.; Ashokkumar, M. (2011): Ultrasonic Recovery and Modification of Food ingredients. In: Feng/ Barbosa-Cánovas/ Weiss (2011): Ultrasound Technologies for Food and Bioprocessing. New York: Springer, 2011. pp. 345-368.